While incense is not often considered a "liturgical art" in and of itself, it seems to me that it perfectly well qualifies as one of them. The liturgical arts are not all plastic arts after all and one need only look as far as sacred music to see this. Incense, like beautiful sacred music, vestments and so on, is an important aspect of liturgical worship both symbolically and 'aesthetically.' It is one of the elements that can create a lasting impact. 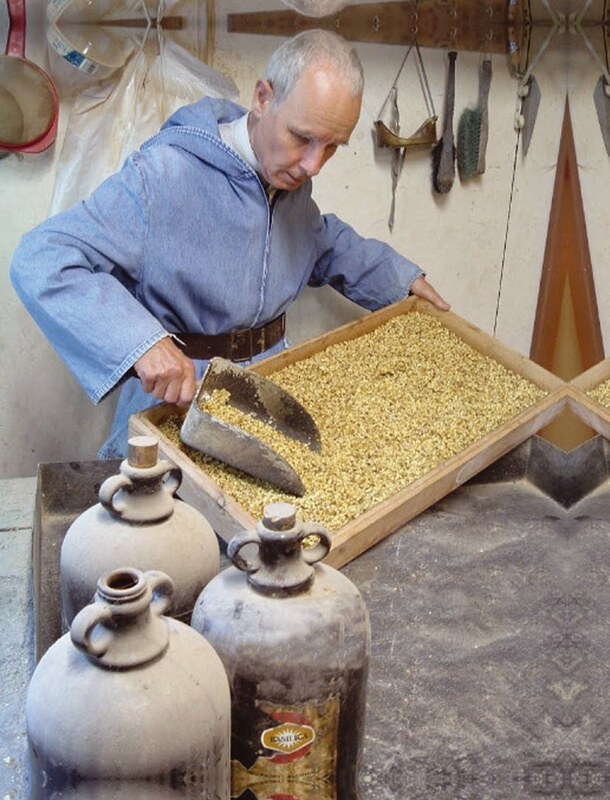 One of the very finest blenders are incense are the Benedictine monks of Prinknash Abbey (pronounced "prin-nage' or 'prin-nish') who have been at this liturgical work for over a century now. These blends are qualitative and highly refined, being distinctive yet not overpowering. One of their very finest blends is called "Basilica" which attempts to recreate an incense mentioned in the Book of Exodus. In addition to Basilica, they carry seven other varietals: Cathedral, Sanctuary, Abbey, Priory, Vatican, St. Michael and Gums of Arabia. Below is found a history of Prinknash Incense written on the occasion of the 100th anniversary of their making of it, and further beneath that is a video wherein the Father Abbot of the community, explains the process of incense making. It is traditionally believed that incense was first made in our Community in 1906. Like all traditional dates this one is not easy to pin down with evidence. But there is some. Abbot Dyfrig Rushton, writing a memoir in 1976, describes how he came to Caldey in November 1916 to join a scheme for training boys in arts and crafts under the patronage of St Joseph. Dyfrig says: "While I was with St. Joseph's boys, I worked mostly with Fr. Samson Carrington in his vestment room and incense department. He was in charge of both." Speaking of Samson, Dyfrig says: "He began the vestment work and the making of incense while the Community were at Painsthorpe; it was he who made up the recipes for the different grades." The Community was at Painsthorp from 1902 until October 1906, when it moved to Caldey. Therefore if Dyfrig is right, incense making started in the first nine moths of 1906 at Painsthorpew Hall, Yorkshire. The problem is that there is no other evidence to support this. The magazine PAX had started in the Painsthorpe days in 1904, and there is no mention of incense until the Caldey period in 1907. In the essay attributed to Abbot Aelred Carlyle called Our Purpose and Method, first printed in PAX in 1905-6 and then called The Benedictines of Caldey Island in 1907, Aelred says that "all our work is done by the brethen - baking, washing, scrubbing, tailoring, carpentering and gardening" but not the making of incense. The first advertisement for "incense made at Caldey by one of the brothers" dates from PAX 7 and 13, in March 1906 and September 1907, and contains a message of thanks to the Rev. R. Sorbey for half a pound and tin of incense. This has been taken to show that the community could not have been making the product themselves. But it might be argued that Richard Sorbey, then Vicar at Prestbury near Cheltenham, was a benefactor in other ways to the Painsthorpe Community. He helped provide for the Sacristy. So it quite possible that his contributions of incense were only to supplement what was already there. It is easy to forget how important incense was to the early community. Aelred had in his possession books on Catholic liturgy that described the traditional practice. The Sacristan's Manual by a certain J.D. Hilarius Dale, explained how "the incense commonly used at Rome is simple Gum Olibanum," and told the interested reader how it could be obtained from a "wholesale chemist at a moderate price." It added that "one ounce of powdered cascarilla bark mixed with each pound of gum olibanum will be found an agreeable compound." Daniel Rock's Hierugia had been in the library at the Community's original foundation on the Isle of Dogs in 1896. It described the usages of incense and its value. Benediction with the Blessed Sacrament after Mass was a common custom in those days. Aelred also seems to have followed the Llanthony priory custom of using incense at Lauds. It is worth noting that the procession from the jetty on Caldey for the celebrated "home-coming" in October 1906 was lead by a thurifer with a boat bearer at his side, as the photograph on the frontispiece of PAX 10 taken by the lighthouse keeper clearly shows. In sum, it looks likely enough that the tradition is correct and incense was made in the community, at least to supplement its own needs, at Painsthorpe in 1906. The manufacturer was Samson Carrington. He had joined the community in 1906, at Milton Abbas, but was not clothed until the first sojourn on Caldey in 1901. He is a most important man in the community's history. It was he who saw the possibility and advantage of arts and crafts. He himself could make vestments and did so successfully at Painsthorpe and Caldey. He ran the vestment and incense departments for many years and had overall charge of all the crafts at Caldey. He never made vast sums of money. That was hardly intention. His idea only flourished many years later - long after he himself had left the community - at Prinknash, in the hands of several able and dedicated Brothers. But in 1906, Samson, as a priest, ran the departments himself and used what labour he could find. He had a difficult time and left the Community in the turmoil of 1920. He died in 1934 and was buried at Stoubridge, where three members of the Community were present at the funeral, including Dyfrig Rushton, who had a great respect for him both as a man and a monk. Samson first produced incense to sell in 1907. Two varieties are advertised in PAX 14, December 1907: "Incense made at Caldey by one of the brothers, from a very good recipe, may be had from us at 6/ - and 3/6 a pound." On page 377 the same incense is said to be a "combination of the choicest gums which burns without any disagreeable fumes." It is also post free. Neither of the two varieties seems to have a name at this time. For the rest of Samson's period the adverts in PAX show that the varieties of incense fluctuated between three and five. None are named; they are distinguished solely by price. After Samson's departure in 1920, the incense was taken over by David Bunce. He joined the community soon after the conversion and was a member of a well-known Dudley family. He was clothed in December 1914. For some years he was in charge of the alumni, where he was very popular as a gentle and understanding monk. It seems that he was the man who first gave names to the varieties of incense, They appear in an advertisement in PAX 63, March 1922, p. 95 as Cathedral (12/-), Abbey (8/-), Sanctuary (6/-) and Mission (3/6). A very cheap variety called "Church" (92/6) was added in the advert for September of the same year (PAX 64 p. 189). It is humbly described as a 'special blend' to "meet the requirements of some very poor missions." The notices, in contrast to today, show the wide variety in prices. Cathedral was five times as expensive as Church. David Bunce suffered from ill health and left the Community soon after his ordination in December 1926. He worked as a priest in the Birmingham diocese until his death in 1948. His place in the incense department was taken by Gabriel Burles. He was the first Brother to take charge. The Brothers had been formed by Abbot Aelred in 1919 when he brought over the Master of Lay-brothers from Quarr to set the scheme in motion. But Aelred's mind there was another purpose. For many years there had been "oblates" in the Community who had no definite status; they took no vows and were free to come and go. Aelred thought the Brothers would provide a definite vocation for them and give the necessary stability and commitment to the Community. Gabriel had been an oblate on and off since 1916. In 1920 he decided to commit himself completely to the newly formed Brothers, and remained one of then until his death in 1975. Gabriel was a slow but conscientious worker. He took enormous pains in preparing the different varieties of incense. Dyfrig, in his memoir, says of Gabriel that "his equipment was very primitive and worked against many difficulties; he was assisted by some of the younger brethren, but it was clear who was the Boss." He found he was able to expand the work after the move to Prinknash in 1928. He dropped Church incense from the list of recipes and introduced a new variety at 16/-, soon identified as Basilica. Priory also appeared in the advert for May 1929 (PAX 91 p. 64). This gave six varieties in all. It is astonishing that the names and prices remained the same right through to the end of the Second World War. Br. Gabriel always suffered from poor eyesight. After the Second World War his vision deteriorated sharply and he eventually became blind. It is not clear who succeeded him in the making of incense. A book marked "Incense DPT" is still in the archives with the name "D. Aidan" on the front. This must be Aidan Haynes who entered the community in 1944. His 'log book', as it is called, begins by listing the 'oils in use' in 1945 with Latin names on the one side and the English equivalent on the other. It then gives recipes for the seven varieties of incense - Basilica, Cathedral, Abbey, Sanctuary, Priory, Mission and Church - which is odd because Church had been dropped from the sales brochure in 1928. New recipes are contrasted with old ones,and some reasons given for the changes. For example "benzion is far to (sic) dear to use in cheap blends," and "the loss of lavender" in Abbey "changes the character of the oil but not for the worse." Aidan has installed some of the new formulas in 1946 and 1947. One curious feature of the book is the use of the old "apothecary weights" that had been popular with chemists in England and America since about 1840. Aidan explains in the middle of the book under the date 1947 that "henceforth the formulae will remain written in apothecaries weight but will be used in practise (sic) as if they were written in aoirdupois." Earlier in the book someone has written in pencil, for those not in the know, that "8 drams = 1 ounce." From Aidan on, the weights are all pounds and ounces. The charcoal formula refers the reader back to the "Black Book," probably compiled by Br. Gabriel but no longer extant. Aidan was sent up to Pluscarden after the foundation there in 1948. The move made way for Joseph Davis. Br. Emmanuel, as he was called after clothing, represents the new breed of Brothers who came after the war; and his short reign is perhaps the most significant in the whole history. He turned incense from craft into an industry. As Joseph Davis from Birkenhead he had run his father's stationary buisness and then continued as a salesman in the same product. When he came to Prinknash in 1948 he knew nothing about incense; but after his profession, he applied all his skills he had learned in the North East and rapidly increased production until he tripled the sales. He opened markets in America and found among his contacts the son of Francis Lawson who had been a novice at Painsthorpe. Lawson wrote enthusiastic letters about his own memories of incense at Painsthorpe and Llanthony where he had also been a novice for a time. He did not mention the actual making of incense, and as he left the community in 1905, his evidence indirectly supports the traditional date of origin as 1906. Emmanuel's greatest achievement perhaps was in the production of charcoal. Hitherto Br. Gabriel's perfumed and standard varieties were the bane of a sacristans life. Charcoal could never be lit in a hurry. As altar servers will remember the tablets had to be heated in a wire basket over a Bunsen burner. It took time. Emmanuel started experimenting in the summer of 1956 with saltpeter dissolved in water and mixed with powdered charcoal and then stamped out in tablet form. The charcoal could then be lit at one corner and in less than a minute the whole tablet was aglow. Emmanuel packaged forty-eight tablets in handsome red oblong boxes and sold them as "speedy charcoal" at £1 a box. They were a prodigious success. In 1958 alone "well over 10,000 boxes, over a half a million tablets were sold" (PAX 279, p. 123), making the blue boxes of perfumed charcoal and beige ones of standard, altogether obsolete. Emmanuel had visions of expanding the business by constructing a purpose built factory at the bottom of the lower lawn. He designed it all himself and priced it at £5000 before the cellarer got to hear of it. The cellarer was alarmed and indignant. He made counter proposals and in the end three ignominious army huts were erected on the site of Emmanuel's dream. They are still there, looking even more ignominious than before. Emmanuel never lived to see them. On the night of the 24th April 1960 he collapsed in a coma brought on by his diabetes, and in the morning he was dead. Dyfrig Rushton wrote a characteristically acute and affectionate obituary. One could hardly have mixed feelings about a man with such a sunny temperament who made light of almost everything including the diabetes that killed him. He did however write letters to the cellarer - some are extant in the archives - pointing out how he, the cellarer, failed to send a sufficient number of novices to work in the incense department and did not ensure that those assigned arrived on time. Indeed Emmanuel tended to badger the cellarer unmercifully. Dyfrig was the cellarer. Emmanuel had brought the incense department on to a rising curve. His death brought another enterprising but very different person, Br. Kevin O'Sheehan. He had been trained as an artist, but possessed many skills, all of which he used to good effect. After his first vows in 1960 he took over the incense department. He reformed the recipes and simplified production. It was in his time that Br. Hugh Dilger made truly outstanding design and lettering for the tins and later cardboard boxes in which incense was sold. The original drawing is still in the archives showing Hugh's remarkable draughtsmanship long before any design programme on a computer existed. But these heady days were not to last. Already the turmoil that arose out of the Second Vatican Council was changing life at Prinknash. Many of the most promising monks left, including Br. Kevin and the very able Hugh Dilger. The Brothers themselves came to an end in 1966 when the General Chapter decreed that there was only one kind of monk. The incense went on to expand still further and vastly increase its sales. But the great creative period was over. We have come far enough. There are numerous boxes and gadgets scattered about the monastery and the estate, including the improbable machines converted by Br. Malachy McGann. It is to be hoped that some enterprising person could gather them all into a small museum before everyone forgets what they were actually used for. And there are the ingredients of the craft, a chunk of benzoin for example, patiently collected by Br. William, and a most all perhaps the memories of so many members of the community past and present that could tell the story of so much ingenuity as well as the plodding endeavour that make up the history. Fr. Aelred our archivist, from whom most of this information comes, writes: "I remember as a novice manipulating a flexible spatula for days on end to catch tablets of charcoal disgorging from the mouth of a Heath Robinson stamping machine. Most of the novices helped in some way or another." Incense was a possible answer to the perennial question that has afflicted nearly all monasteries since the High Middle Ages - how to find an occupation for a community that is useful and interesting and at the same time integral to the life. And of course it survived. The incense is still thriving, solvent and visible. The design on the packages is still that of Br. Hugh's from forty years ago. The names of the varieties are the same as they are eighty years ago and the product itself reaches back a hundred. When Samson Carrington, in 1906, at Painsthorpe, turned from cutting vestment material to try his hand at mixing ground gum olibanum with oils, he never knew what he was starting!